This chapter explores the idea of tourism development and discusses ideologies and strategies for developing and least developing countries. 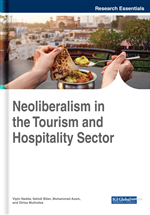 The chapters explore the ideology of neoliberalism for developing the tourism as a sector. The chapter argues that in the era of a dearth of resources, and decreasing trends and rationality for state intervention, it is pertinent and significant to develop the tourism sector by following the strategies based on principles and ideals of neoliberalism. The chapter also cautions about some limitations of using neoliberalism as a model of development. Tourism consists of activities or process of tourists. A tourist is someone who travels for 24 hours or more outside the normal country of residence (Sharpley & Telfer, 2002). The activities and purpose other than the normal instrumental life of making a living and with a visitor (tourist) motivational purposes of for temporary business, leisure, pleasure, health, entertainment, travel and for experiencing change soon (Sharpley & Telfer, 2002). the activities of tourism are related to temporary escapism from routines. The activities are supported by diverse, fragmented and multi-sector industries. The tourism activity is largely dependent on physical social, cultural and historical attributes of the destination. So, a perfect tourism requires a perfect ecosystem of core and allied industries. However, to develop such an ecosystem requires socio, political and economic investment. Tourism is ecosystem requires investment and cannot solely rely on either on private or government sector. It needs the support of a range of stakeholders. The sectoral development requires a developmental model. traditionally economic development had relied on a fight between two extreme poles of capitalism and socialists. However, with less success, there is a need for an efficient Economic model of tourism development. The recently many economies have focused towards neoliberalism as a solution to develop their tourism industry. The sector is at the forefront of the economic development of countries. Hence there is huge interested in developing this sector. The main objectives of development are sustenance, self- esteem, and freedom. The development includes a development ideology (ends) as well as a development strategy (means). The development ideology could be capitalism- conservative, liberal or social radical (Sharpley & Telfer, 2002). Historically the paradigm of development strategies has changed in four phases- modernisation (1950-60), international dependency (1960-170), Economic neoliberalism of markets (1970-180s) and alternative sustainable development (the 1990s). The agents of tourism development can come from public or private sector or both. In developing countries where the private sector has been less developed the role of development of tourism has been undertaken by the government but with lower success. Britton (1992) had developed three tired- structured model of tourism development – headquarters, branch offices and small-scale tourist enterprises in less developed countries. In late a960s, the neoliberal paradigms argued for international aids for developing tourism in the developing and least developed countries. However, very recently the researchers have shifted focus on suitable development in the tourism, and local dependency and development rather than international dependency.